After we posted our card skimmer in the wild and attack of the card skimmers stories, many people responded by saying that they've seen these illegal gadgets everywhere. Well, can you prove it? 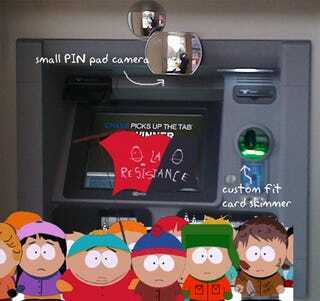 • Difficulty inserting or removing your ATM card. • If there are other ATMs around, compare them side-to-side, if one of them looks unusual, it's time to pull out your cameras. Take photos of them in—camouflaged (or not) on the ATM—and then e-mail them to us at tips@gizmodo.com with the subject line "Card Skimmer Beatdown." Please don't forget to contact the authorities/bank managers before you leave. In the war between card skimmers and Gizmodo readers, it's time to fight back.